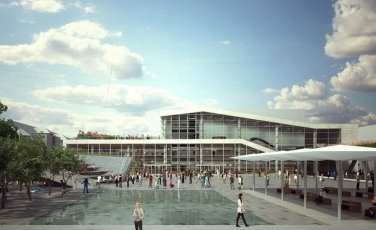 HBM Soletanche Bachy are pleased to confirm they have been awarded a contract to work on a deep foundation reconstruction project at the Újpest, Market Hall and Cultural Center, Budapest, Hungary. The deep foundation works will last for 7 months. This timeframe includes the construction of public utilities. Working under consultant, Firka Építész Stúdió Kft, the project is expected to finish in July 2017 and has an overal value of €19m. In the immediate vicinity of the construction site, there are houses and an operating market, therfore HBM Soletanche Bachy are paying close attention to ensure the ongoing transportation services of the market, parking and pedestrian traffic are not affected. For the construction of the utilities, special care is being taken to enable the construction of the ramp leading to the garage of the new markethall. The new sewer was executed by microtunneling method under the existing building of the old markethall.